John R. Rhoades died on Tuesday, April 17, 2018, at his home in Nevada City surrounded by family and friends. He was born August 5, 1928, in Council Bluffs, Iowa. In 1948 he married Colleen Potter, and together they successfully raised six children. John and Colleen would have celebrated their 70th wedding anniversary in August. He is survived by his wife, six children: Lenore (Mike) Triba, Ron (Mary) Rhoades, Ray (Sally) Rhoades, Julia (Mike) Vaughan, Lynnette (Descoe) Chentnik, and Anita (John) Lillis; nine grandchildren, and 3 great grandchildren. John and Colleen lost their first child, Johnny, in infancy. John was ordained in 1962 as a minister, serving as one of Jehovah’s Witnesses. For the last 35 years he devoted himself as a full-time volunteer Bible teacher (Matthew 28:19, 20). To support his full-time volunteer ministry and his large family, he operated a commercial cleaning service in Nevada County. Colleen and each of the children eventually worked along with him in the family business. His greatest joy was in seeing his children continuing to live in accord with Bible principles and serve Jehovah God (3 John 1:4). He set a life-long example in devoting himself to helping others. He taught his children to defend truth, show love to all people, and to trust in God’s promises. John is remembered as having a quiet, sometimes inscrutable nature. Yet he enjoyed a good joke or comic, and was known for his hearty laugh. Those who knew him were privileged to see the subtle twinkle in his eye when he would say something funny, or unexpected, with a straight face. His English friends called this his “cheeky” look. He loved all learning and knowledge, but he especially loved God’s Word, The Bible. He was an exemplary Bible Teacher who loved to share what he learned and never stopped learning himself. He was known for his flawless memory of Bible verses. 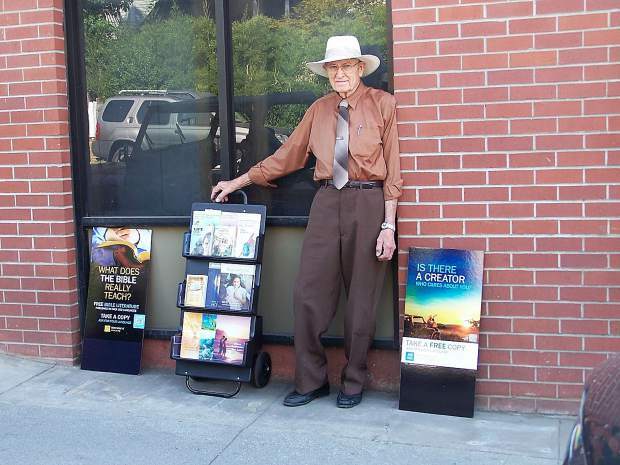 Many will remember his presence at the local Post Office with his Bible cart. His wife Colleen wants everyone to know that after living up to his dedication to his Creator, his main goal was to be a good husband and a successful father. He is remembered for his love of music, his beautiful singing voice, which was heard almost constantly, and dancing with his wife. He also taught all of his children and some of the grandchildren how to play cribbage. Sometimes, as new students he let them win. That did not continue when he felt they had become proficient. He loved everything about nature and the outdoors, whether it was wandering the vast prairies of Colorado, swimming far out to sea from the beaches of California, or exploring the canyons and rivers of Nevada County, sometimes with a gold pan in hand. He was a truly humble man who taught himself to find great pleasure in the simple things in life. He is greatly missed, but will be reunited with his loved ones when Jesus fulfills his promise at John 5:28, 29, “All those in the memorial tombs will hear his voice and come out . . . to a resurrection of life.” We look forward to embracing him and his infant son very soon in the paradise on earth (Ps. 37:11). A Memorial Service will be held at the Kingdom Hall of Jehovah’s Witnesses on May 5, 2018, at 2 p.m. 12524 Burma Road (at Brunswick Road), Grass Valley. All are welcome.